When you think of a home improvement, new gutters may not be the first thing that comes to mind, but having high-quality seamless gutters and maximizing your protection by also installing leaf guards can make a big difference when it comes to protecting your homes integrity. After all, a Team Vinyl and Roofing Co. roof does a great job of protecting your home and family from the weather, including the rain, snow and ice we experience here in New Hampshire and Vermont. But no roofing installation is complete without a well-designed, sturdily built and professionally installed seamless gutter system. All that rain and melting snow flowing off your roof needs to be carried away from your home to prevent expensive water damages and other issues. 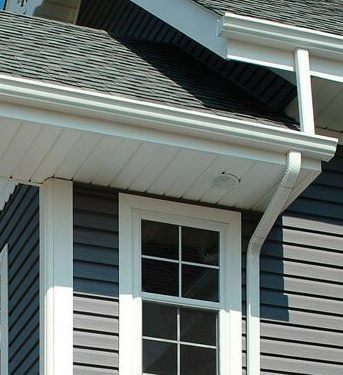 A replacement of aged gutters or an installation of new seamless gutters can prevent siding or sill erosion, foundation problems, landscape washouts, undermined driveways, patios, and walkways, and even the home's structural integrity while adding beauty. 5" K-style seamless gutters & downspouts. Aluminum seamless gutters available in 16 colors. Gutter Cap now available in metallic & granular to match your shingles. New flip-up mow under hinged downspout option-FREE with every new system we install! Team Vinyl and roofing Co builds and installs quality Englert seamless aluminum and copper gutter systems for New Hampshire and Vermont homes that are designed to handle the heaviest rainfall, safely and efficiently. Each gutter system we install is designed specifically for your home and your roofing system, and because our gutters are seamless, there is no chance for leaks. Aluminum gutters are very friendly on the homeowner's budget. Copper gutters make a real statement as to how you think about your home and how you measure value. With each passing year, copper ages gracefully, developing a beautiful patina, yet it still retain its complete structural integrity so that it may outlast many of the homes on which it is fitted. Copper gutters may be more expensive initially but if you intend to build your home to last and if you or children will still be in the home in 10, 20 or 50 years then copper becomes a very smart investment. Once in place it will never need replacing. Well as the name implies, seamless gutters eliminate the seams commonly found in sectional gutter systems. In an old traditional, sectional gutter system (installed using pre-formed lengths of aluminum gutter) if the length of gutter needed exceeds the length of a pre-formed gutter section (which it usually does), multiple sections need to be hooked together until the full length is reached. Every time 2 sections are connected, a seam is created – which also creates another opportunity for leaks to form.